JW ANDERSON sweater, skirt, and boots. LOEWE shirt and pants, JW ANDERSON boots, and talent’s own jewelry. While countless interns were cataloguing Getty photos of the best-dressed celebrity looks from the annual Spring Met Gala, a then 25-year-old Kimberly Drew was working their dream job, as social media manager for the Met. But her spirited energy and girl-next-door warmth make the kind of person you can’t help but root for, even if there’s a fair bit of envy mixed in. The role condenses the many aspects of Drew’s practice—activism, curation, writing, and the advancement of a more inclusive museum space through highlighting artists from underrepresented groups. 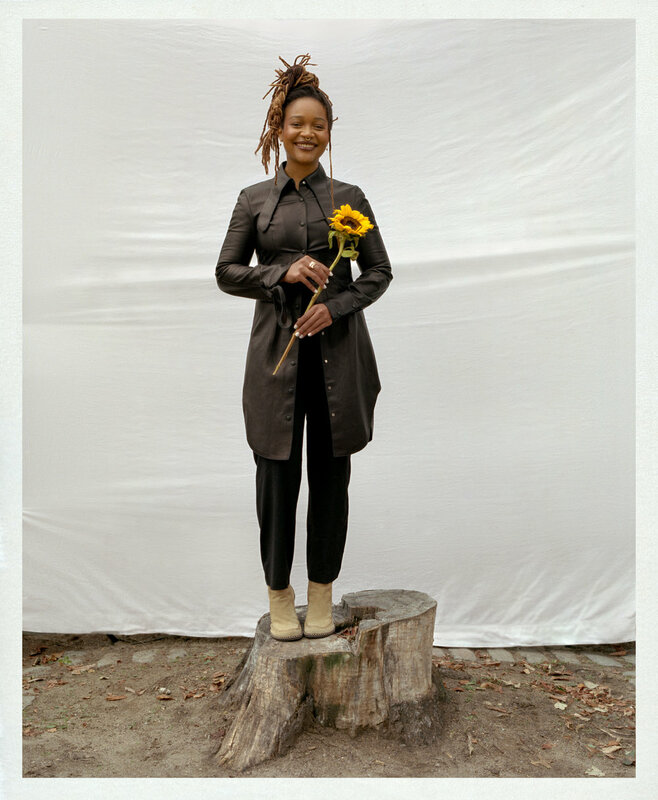 Back in 2011, before she landed her role at the Met, and before the viral Instagram success she’s achieved with her @MuseumMammy account, Drew was still in college, making her way through studies at Smith. Like many of us, she made a go at stability and practicality before deciding to pursue her creative passions, switching from her original major, math, to art history with a museum studies concentration. During her sophomore year, she interned at The Studio Museum in Harlem, where she immersed herself in art and culture. But she’s always been in the art world orbit. “My aunt is an artist, and she works in city government, so I grew up seeing most of these galleries that I would later visit as an adult. There was this funny moment where I said, ‘This is what I’m going to do,’ and my aunt was like, ‘Haha, of course, you are.’ But there have always been things kind of drawing me in that direction. It was part nature and part nurture,” Drew tells me. While working on her concentration in museum studies, Drew researched ways museums use digital communication, a role that foreshadowed her job at the Met. It was during this time that the moniker @MuseumMammy was created. Partially drawn from a secret obsession with the word “mammy,” a racist archetype in media and branding (think Aunt Jemima) that permeated culture as an image for working black women from the 1820s to the 1930s, Drew wanted to repurpose and reclaim the word, as well as to pose questions how women’s roles as laborers in both public and domestic settings are understood. “I think we oftentimes are miseducated about the role of women and the role of women in domestic space and the way we conceptualize around labor. I think I’ve always been obsessed with how the name looks, how it spelled, how it sounds, and that it is such a charged word.” The account acts as a platform for Drew to share an inside look at the world of artists, galleries, and museum shows that she works within, interspersed with inspirational content, support for up-and-coming artists from underrepresented communities, and shots that show off her sense of fashion. LOEWE shirt, and talent’s own jewelry. Drew lets me know that her time as the Met’s social media manager is coming to an end, but that there’s much more to come: she’s wrapping up a book focusing on black creativity, The Black Futures Project, with The New York Times’ Jenna Wortham, while also planning trips to Houston and El Paso to continue artist advocacy work. Drew holds a position at the forefront of the changes reshaping the ways art is presented, artists are advanced, and the public engages with museum and art spaces, and it seems she’ll have a major role in shaping the face of things to come. And now that the Met might be hiring soon, it’s time to polish up those resumes.